LED Fire Tie #WearableWednesday « Adafruit Industries – Makers, hackers, artists, designers and engineers! Andy Modla sent in his great project- a LED fire tie! Stay mentally warm this winter with a LED simulated fire in a tie. It was built with a 8×8 color LED matrix and an Arduino Pro Mini 5V/16MHz. The software is from http://forum.arduino.cc/index.php?topic=150881.0 written by giladaya. I modified it to use the Adafruit display. 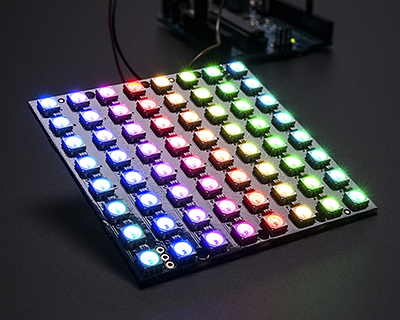 Adafruit NeoPixel NeoMatrix 8×8 – 64 RGB LED Pixel Matrix – Put on your sunglasses before wiring up this LED matrix – 64 eye-blistering RGB LEDs adorn the NeoMatrix for a blast of configurable color. Arranged in an 8×8 matrix, each pixel is individually addressable. Only one microcontroller pin is required to control all the LEDs, and you get 24 bit color for each LED. Read more.